Log-EQF The best logging program. 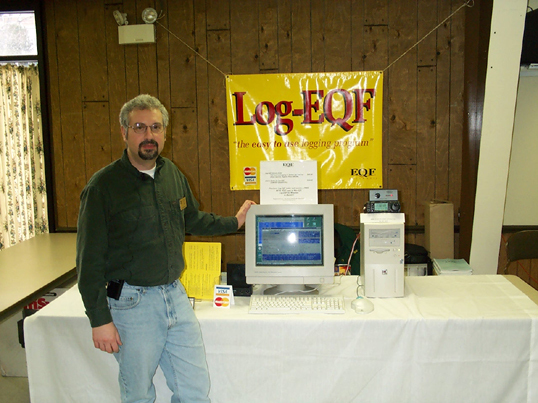 Released in 1989, Log-EQF has evolved into a fullfeaured, yet easy-to-use logging program. Beyond it's powerful logbook features, Log-EQF provides rig-control, TNC and cluster support, a CW keyboard and memory keyer, award tracking, QSL and address lables, antenna switch and rotor control, callsign database interface, and much more. Compare the features, performance, and price, and you'll find that Log-EQF is a time-proven value. Mouse or keyboard control over program menus, in DOS, Windows, or OS/2 (on any 80286 or better PC). Interfaces with popular callsign databases. Search or Sort logbook by any field. Notepads (6 lines) based on either callsign or QSO. Scratchpad for "doodling" during the QSO. Grid Square lookup for beam handling and distance. Fast and convenient roundtable opeartions. Prior QSO information displayed automatically when callsign is entered. GOLIST program (starter GOLIST database included). Print QSL labels, address labels, and logbooks. Contest/DXpedition mode with dupe checking, QSO rate display and contest multiplier display and tracking. Award tracking for DXCC, WAZ, WAS, VUCC, County-Hunters, and IOTA. Interfaces with all computer-ready rigs to display and control frequency and mode. Interfaces with data controllers or TNC's in command mode. Complete PacketCluster support with filtering and quick alerts for needed ones. Split transmit/receive data terminal screen with macro keys and fast file uploads and downloads. CW memory keyer and keyboard with macro support for automatic sending QSO exchanges. Support for antenna switches (TopTen or homebrew) controlled from LPT ports. Works with all popular computer-ready antenna rotators. Switch between two complete computer-controlled stations right from the logging screen. Pull all available information into the logbook form popular callsign databases Amsoft, BuckMaster Hamcall, QRZ!, Radio Amateur Callbook, and SAM. Works with the GOLIST QSL Manager Program to display and insert information into the logbook. Starter GOLIST version included! Import and Export logbook files in many database formats, including the ADIF standard. True ASCII text used for logbook files, with published file format. Provides many of the features offered by Log-EQF, but without the overhead of provisions for RIG, TNC, or antenna rotator interfaces. Lower system requirements. Runs on any 8088 or higher PC processor. Requires less than 2 megabytes of disk space for full operation. Award tracking for DXCC, WAS, and WAZ only. Logbooks are easily transported betweenthe full Log-EQF and the Jr-EQF program. Complete control over Kenwood rigs. Provides scanning, memory storage, transmit/receive, and metering capabilities for Kenwood rigs that support these features. May be used as a stand-alone program or as a popup from the Log-EQF program. Outside North America, please add $3 shipping charge. Pennsylvania residents please include 7% sales tax. or phone or FAX to order direct: 1-724-457-2584. Or, send your order to the mailing address at bottom. EQF Software accepts VISA or MasterCard, or personal checks drawn on a US bank.